Project interviewed residents on ways to strengthen neighborhood. 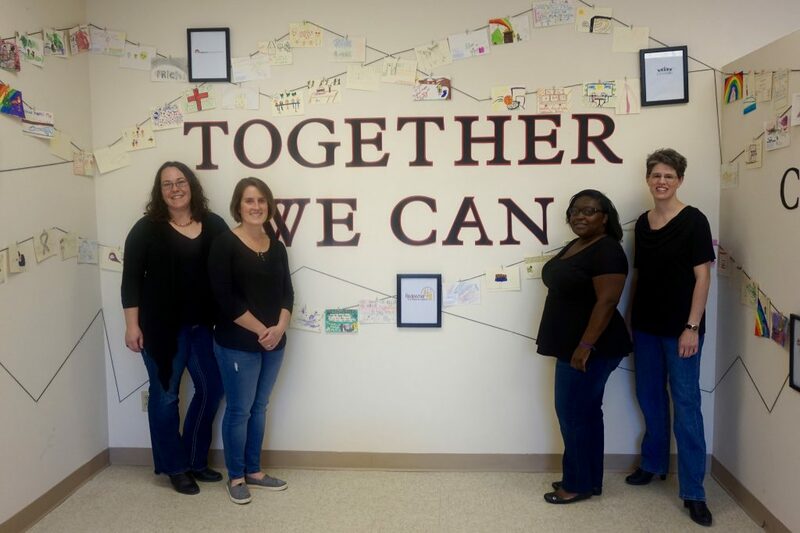 Ali Kopyt, Emily Dalton-Niles, Erica Horton and Lori Albers (left to right) used the motto of the Avenues West neighborhood, “Together we can” to inspire their project. Photo by Allison Dikanovic. A window with big block letters spelling out “Mobile Design Box” popped up this past weekend on 27th Street, catching the eyes of passersby and sprucing up a short stretch of vacant storefronts. Inside, walls lined with crayon drawings, handwritten poems, logos of local neighborhood businesses and inspiring messages demonstrated the vitality of the Avenues West community. The display was part of the Avenues West Community Art Project, a gallery created by neighborhood residents and curated by a team from the community leadership program Future Milwaukee. “We wanted to use this as a way to promote the assets that are here and …have art be the way we show the different experiences of people in Avenues West,” said Emily Dalton-Niles, a marketing and public relations professional who is part of this year’s Future Milwaukee class. Future Milwaukee builds capacity in local leaders by focusing on professional development, expanding community connections, and deepening appreciation and awareness of Milwaukee’s many assets. “I want Future Milwaukee students to engage with and deepen their understanding about the complexities of living and working in an urban environment and the critical thinking skills that need to be applied as a leader in different intersecting systems,” said Christine Hill, the organization’s executive director. 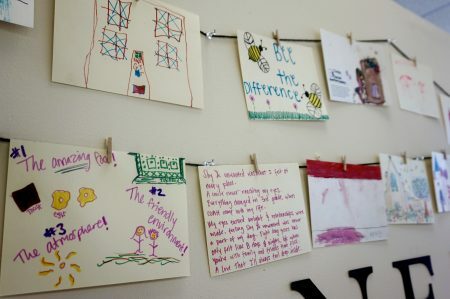 Students, residents and employees from Avenues West created artwork about what makes them happy in their neighborhood. Photo by Allison Dikanovic. The participants, an intentionally diverse group who work in a variety of fields and represent a range of ages, genders, races and ethnicities, were split into groups of four or five and assigned to one of the neighborhoods in the Near West Side. Their task? Investigate the history, talk to those who call the neighborhood home and figure out a collaborative, community-driven project that could benefit the area. Dalton-Niles and three of her colleagues set out to learn more about Avenues West. The team hosted two art build days at local businesses Ruby G’s Espresso Bar and Café and Miss Katie’s Diner, where they invited local residents to come and create a piece of art based on the prompt, “Avenues West makes me happy because…” The Future Milwaukee team encouraged participants to replace “Avenues West” with an organization or business they are involved in, to show its value to the neighborhood. Team members also visited organizations including Highland Community School, Penfield Children’s Center, Marquette University, Redeemer Lutheran Church, City on a Hill and Daddy’s Soul Food to facilitate creative workshops. The exhibit, titled “Together We Can Connect a Neighborhood,” debuted during Gallery Night and Day and featured pieces from nearly 200 members of the Avenues West community. Daddy’s Soul Food, one of the many businesses highlighted by the project, catered the event. “I hope all who visited the gallery feel empowered and encouraged to tour the neighborhood and stop in to some of the places we did, and engage with the residents and the owners in Avenues West,” said Erica Horton, an accountant and Future Milwaukee participant. Other Future Milwaukee projects in the Near West Side neighborhoods included resources fairs, community cleanups and resident surveys.